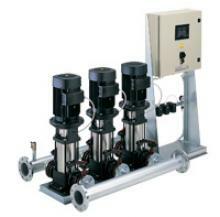 The Grundfos Hydro 2000 is a pumping system built as a complete factory tested and backed turnkey package. Systems are built on stainless steel base frames and incorporate CR(E) pumps and stainless steel manifolds, non-return valves, pump isolation valves (2 per pump), pressure transmitter, pressure gauge, pressure tank and a control cabinet come as standard. The Hydro 2000 is perfect for applications where constant pressure is required to protect your irrigation or water supply infrastructure investment.